Eiffel Tower, tallest building in Paris build in 1889 with 1063ft, I heard the name since I was a kid, seen thousand of photos and finally today I have the chance to witness myself the symbol for the entire nation of France and lucky enough to have the prewedding session over there… I shall go back again tomorrow for night scene shooting..
agnes sim - OMG, i tot every gal wish to have pre-wedding in this such lovely place. Nice shot! Vodka - thumbs up Edwin !! Louis - Wow! 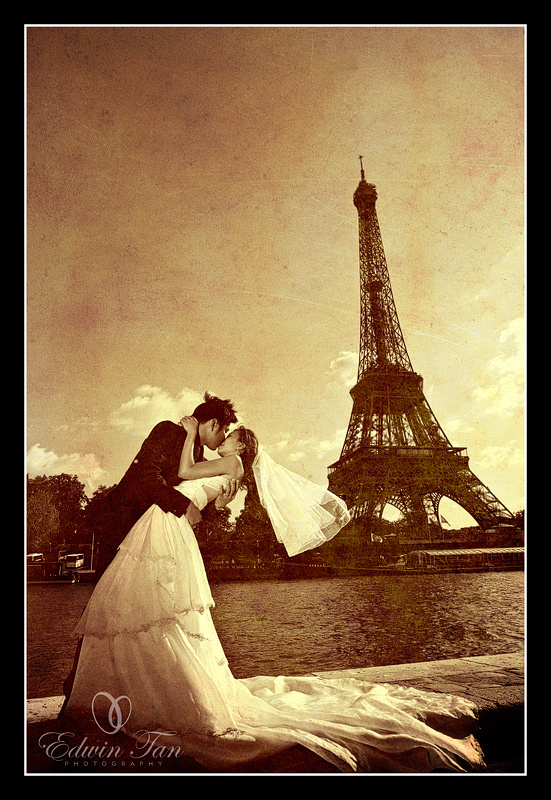 what an incredible pic….so so so romantic! Winnie Chen-Head - What a beautiful image. It must be nice (weather wise) there now for the couple to be able to take a picture like this. I was there in New Year last year and it was freaking cold!!! Seeing the Tower is like a dream come true for me as well. wenping - A very good shoot!!! Thumbs up! tzinsimon - thumbs up man……..reali like tat color n effect…..
glad to see your works,is no easy to take photo at this background.cheers. I am planning to do pre wedding photo shoot in either London or Rome in May 2011. I was wondering if you have any package on this? what does your package consist? edwintan - Sure, do you mind to send me your email address to edwin@edwintcg.com ? Jovinm Ngiau - these is the one that im looking for….